When I first started sketching the Isometric Scarf, I had it all charted – I really wanted to get all those corners between the vertical and horizontal ribs just right. When I started scaling the pattern to get the right proportions, I noticed that I could also grade the design up to a wrap size, but it would mean really large, repetitive charts. In the end I wrote the pattern in a more succinct and logical way, and this allowed me to leave out the charts and include that larger size. I liked being able to show that the pattern can be scaled, which allows knitters to work one size in a different gauge to get the other, or even compare the sizes and cast on somewhere in between. 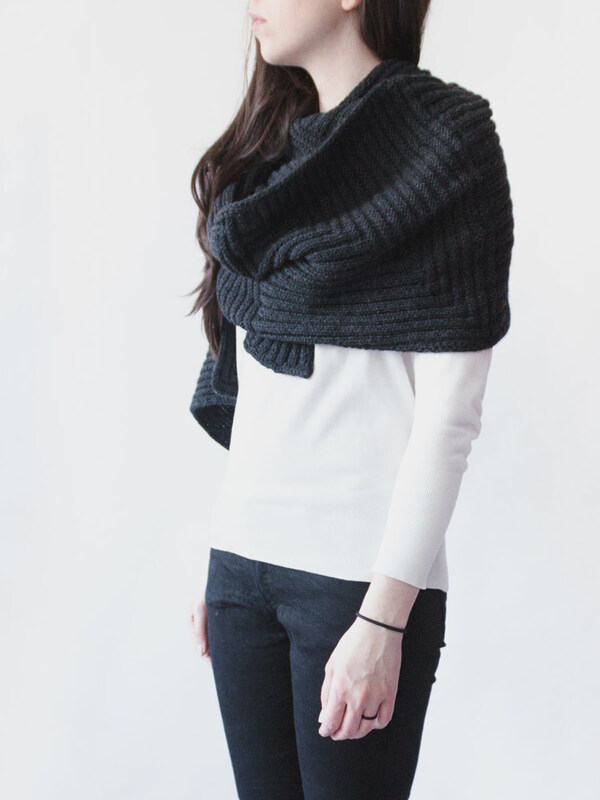 The scarf size is made up of more blocks and the wrap fewer but larger ones, which feels a bit counterintuitive. 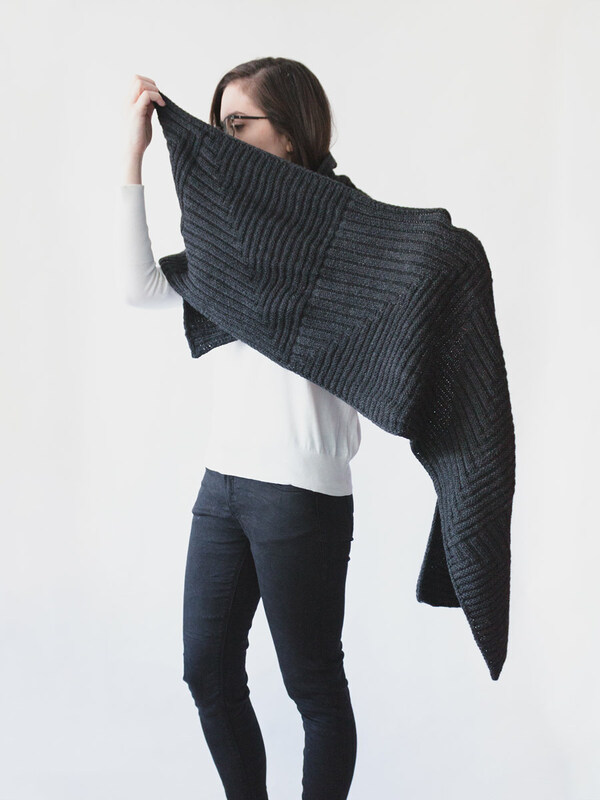 It means that you can actually knit a block of the scarf in one sitting (which I really liked) but once you finish one block of the wrap, you’ll be much further along (not bad either)! 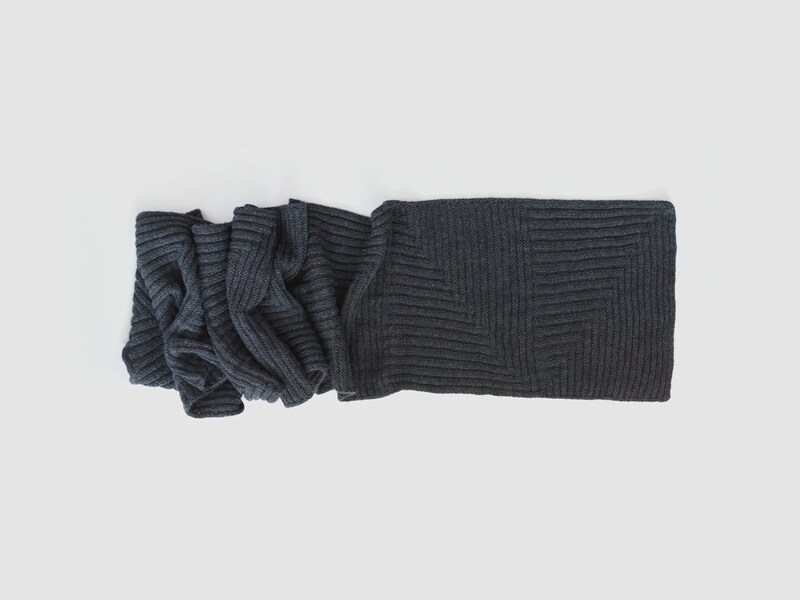 I knit the wrap size for myself with Cascade 220 in the colour Jet, which is a really, really dark grey. I’m so happy that all the lines are completely visible even in a yarn this dark. This has become my everyday scarf now and coming from almost exclusively wearing cowls for years, it’s a nice change. I can wrap it tighter or looser, I can unwrap it completely and wear it on my shoulders, I can take it off while wearing earbuds with my phone in my pocket without getting all tangled up… Rectangles, so versatile, who knew! ? 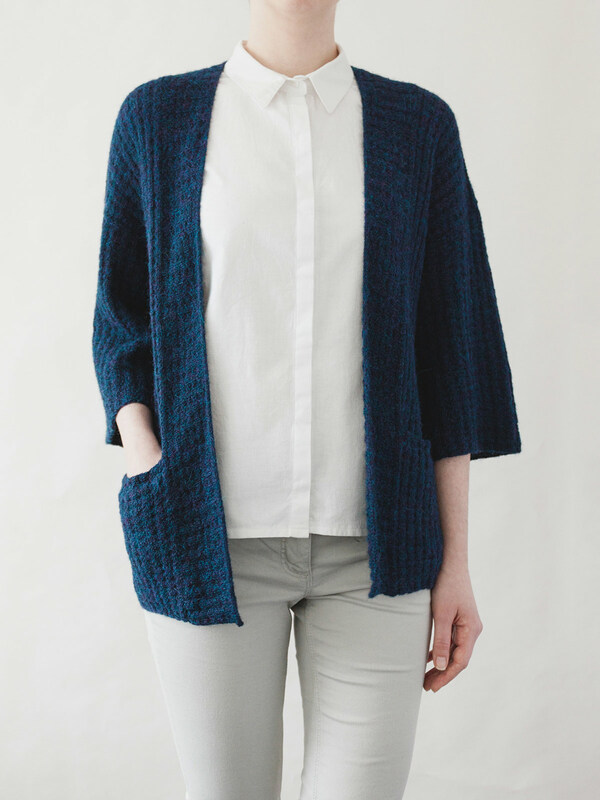 Alinea is my latest self-published pattern, a sport-weight cardigan that I brought out last month. It’s a beautiful autumn day today so I thought I ought to write a little bit about my favourite autumn cardigan! I originally knit the first prototype of this design two years ago, and it was one of my favourites for a long time – still is, actually! But there have always been a few details that bothered me a bit – the body was a bit too long and stuck out of all my coats, the neckband at the back neck was a bit too loose and the sleeves slightly too wide. I don’t want to admit how often I get a sleeve caught on a door handle wearing this grey version, though that probably says more about my clumsiness than the design..! The final version of the design has all of my favourite elements of the prototype – the ease, the lines, the pockets – with more refined proportions and a better fit. 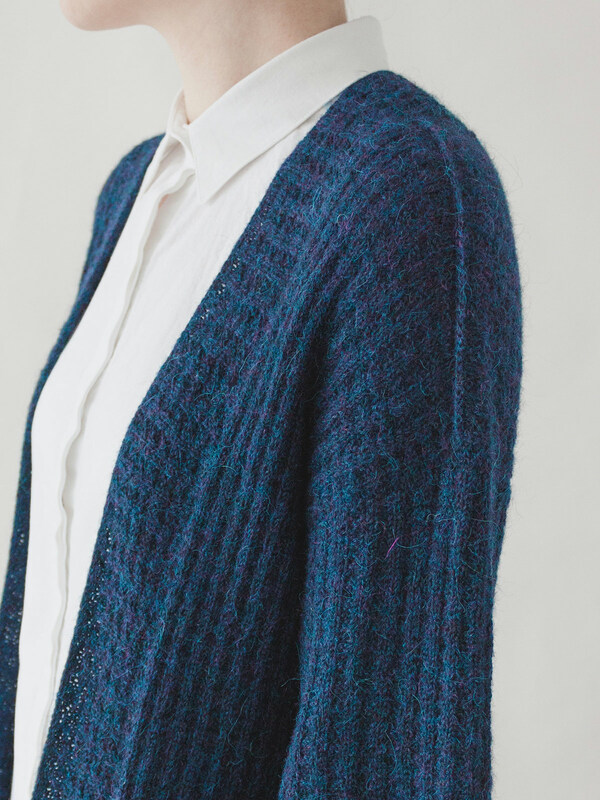 It’s a really versatile cardigan that’s easy to dress up as well, which is always a big plus for me as I’m always cold and always happy when I can wear something warm on the off-chance that I need to dress a bit neater! 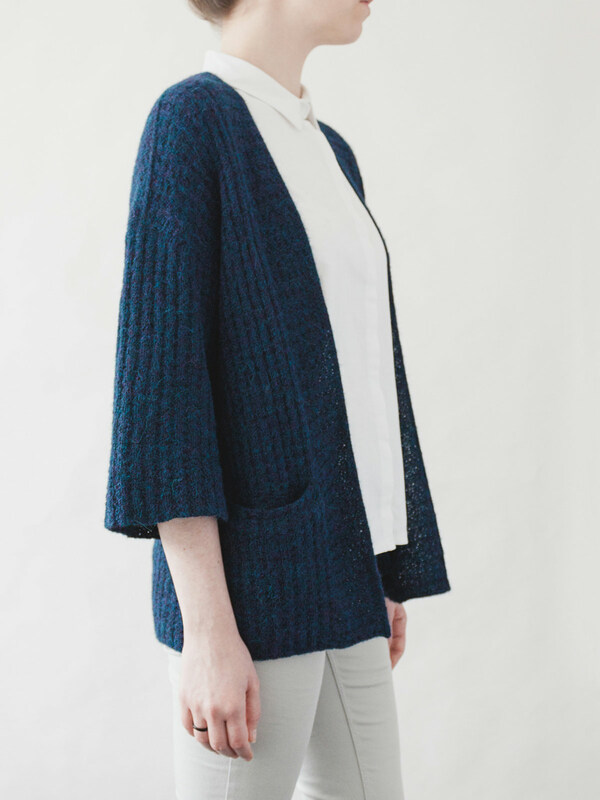 The name, ‘alinea’ means paragraph in Dutch, which I thought was quite suitable, a block of text for a cardigan made up of mostly straight lines and blocks. Read more about it on the pattern page or on Ravelry. All photos by Nicole Mlakar for Pom Pom Quarterly. 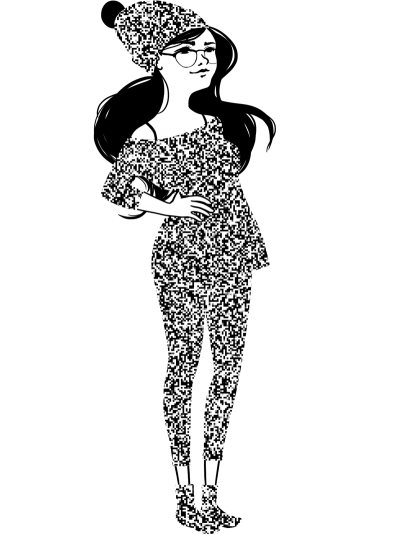 Meet Diesis, my newest design for issue 22 of Pom Pom Quarterly! 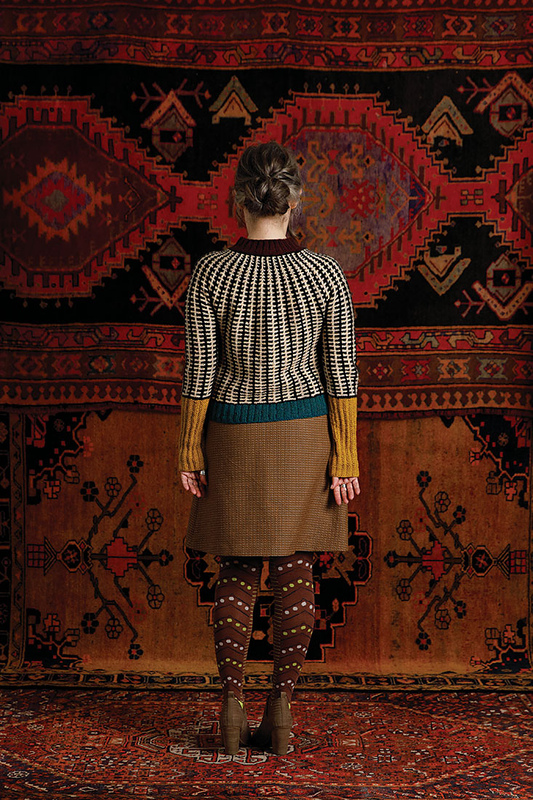 This autumn issue was guest edited by Juju Vail and aren’t the knits, models, photos and styling just beautiful? I was really drawn to all the pattern mixing and the rich, bold colours that Juju wanted to use and was so delighted to see how it all came together. For my piece, I started doodling stripes, checks and crosses and came upon this stitch pattern that has a bit of each of these elements. As I was working on the sample, I realised the all-over pattern the stitch created looked like a bunch of double daggers, the typographical symbol ‡, also known as a ‘diesis’. 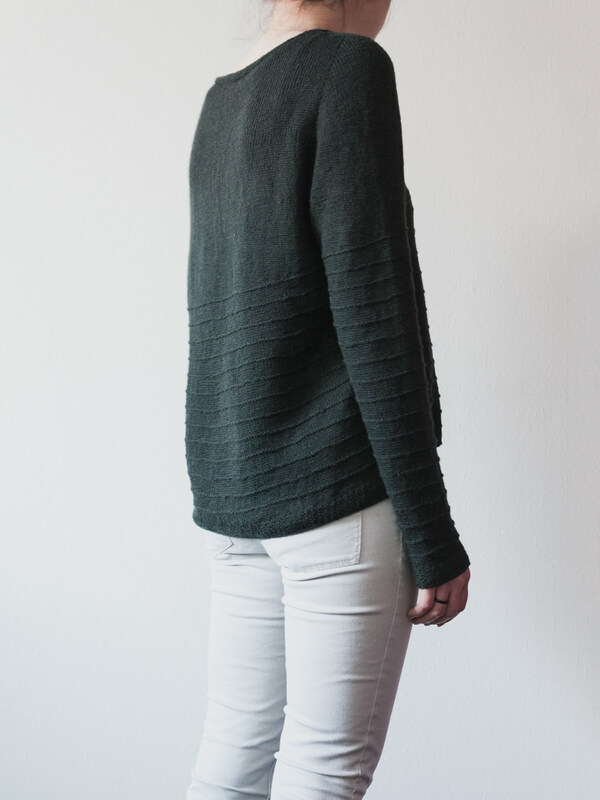 The way the stitch grows at the yoke is my favourite bit of the design but I also love the extra deep cuffs and the way they affect the proportions of the jumper. I had sketched at least 8 combinations at some point but narrowed it down to these two. In the end we decided on the black and off-white with contrast cuffs and the John Arbon Viola colours were the final, and absolutely perfect, piece to the puzzle. If you also like to play around with colour, I made an interactive colouring page here with colour pickers for each colour so you see what all sorts of different colour combinations will look like. 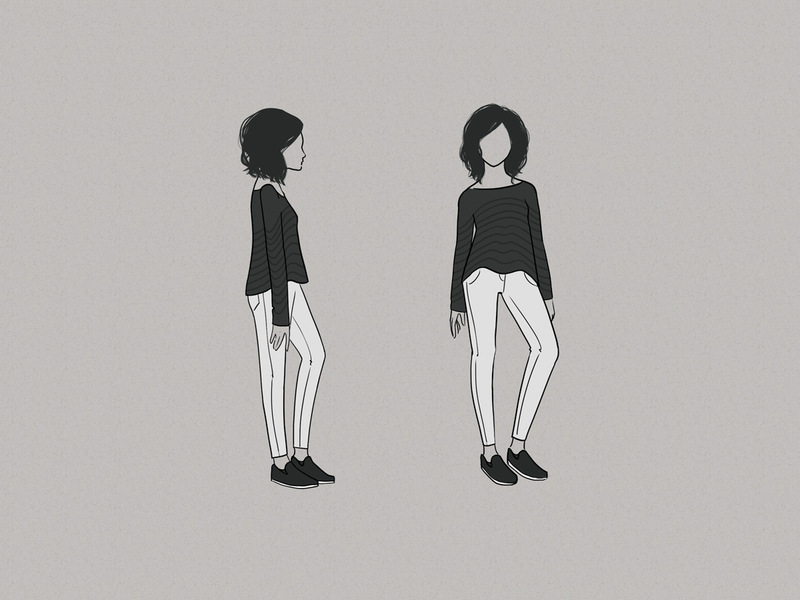 Some details on the jumper: it’s knit top-down in the round, with a circular yoke. 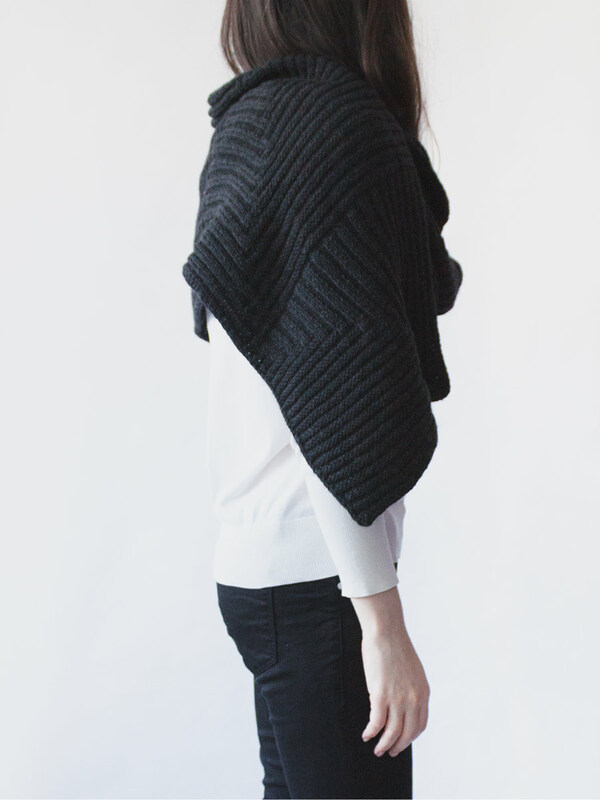 The stitch is a mosaic/slip stitch pattern, which means only 1 colour per round so the knitting goes fast and the entire garment is nicely stretchy. There are some short rows at the back neck worked into the stitch pattern to make sure it sits a bit higher than the front neck. The body has an a-line shape. I’ve written the pattern in a way that should make it easy to modify the length of the cuffs, if you prefer a more conventional cuff length. Issue 12 of amirisu magazine was published this weekend and I designed a pattern for it, Minamo! 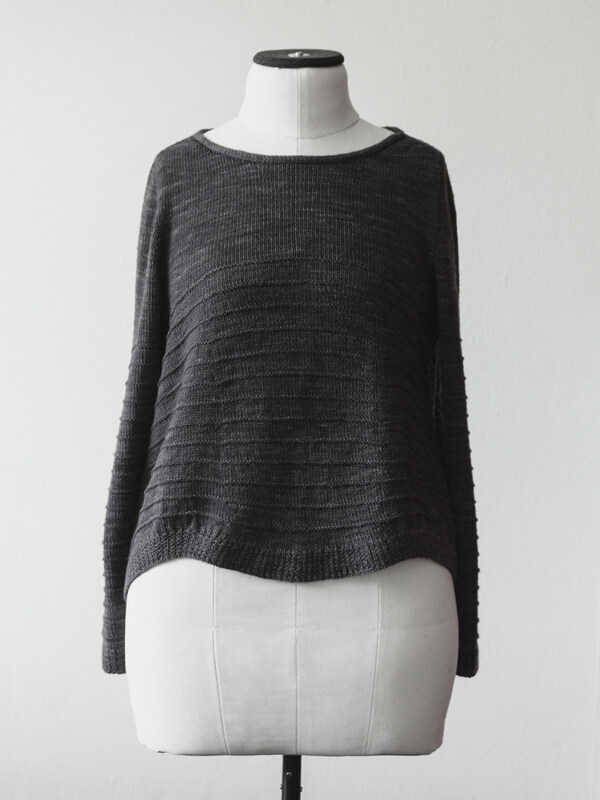 It’s an a-line shape pullover, with contiguous set-in sleeves and a lot of short-rows – with plenty of stockinette but definitely not a boring knit. As it’s knit top down, in the round and in one piece, there’s very little finishing involved. the submission sketch; hi faceless ladies! 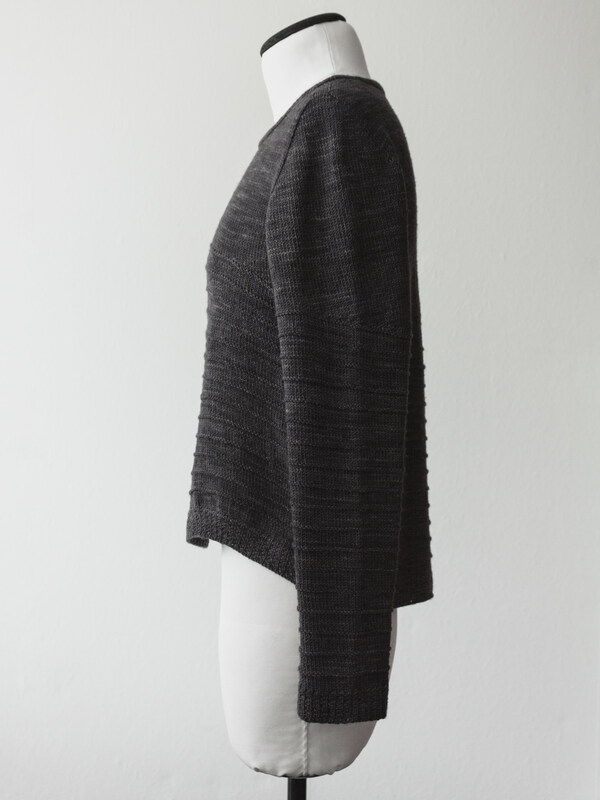 For this pullover, I wanted to combine a geometric element with a more organic one – the parallel stripes playing with the flowing, irregularly shaped hem. 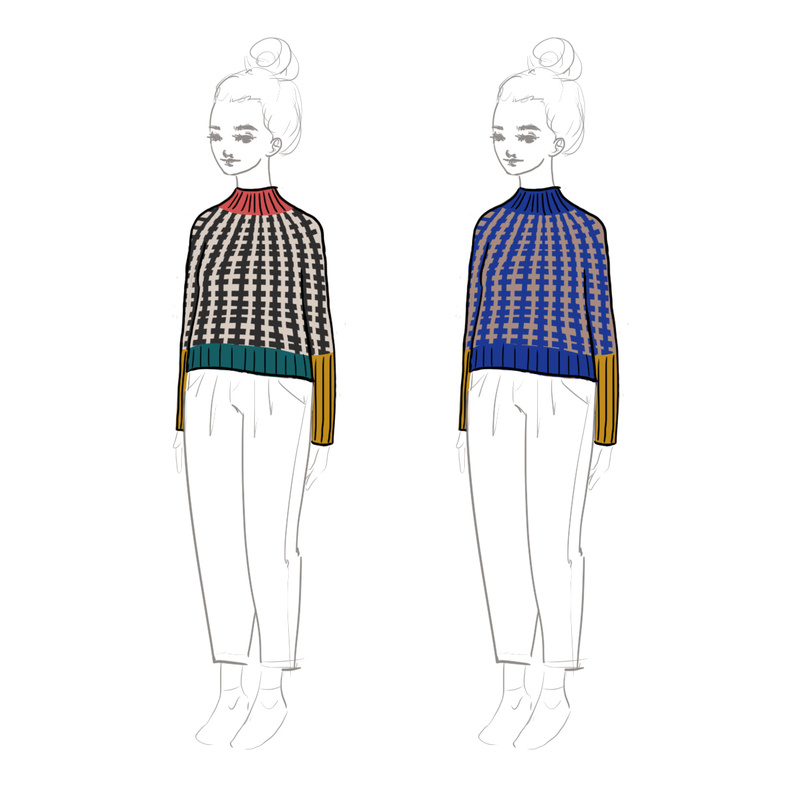 Instead of having the stripes independent from what’s going on in the rest of the sweater, they follow the shapes of the sweater itself: dipping at the back along with the hem, and also following the shaping at the front. After shipping the sample off, I knit myself another one, this time in that dark green unravelled Colourmart yarn from my last post. The yarns are quite different – even though they’re both merino wool – so the finished pullovers look a little different too. My row gauge for the second one was off, which I figured would be fine as I’m a bit taller than the amirisu model. 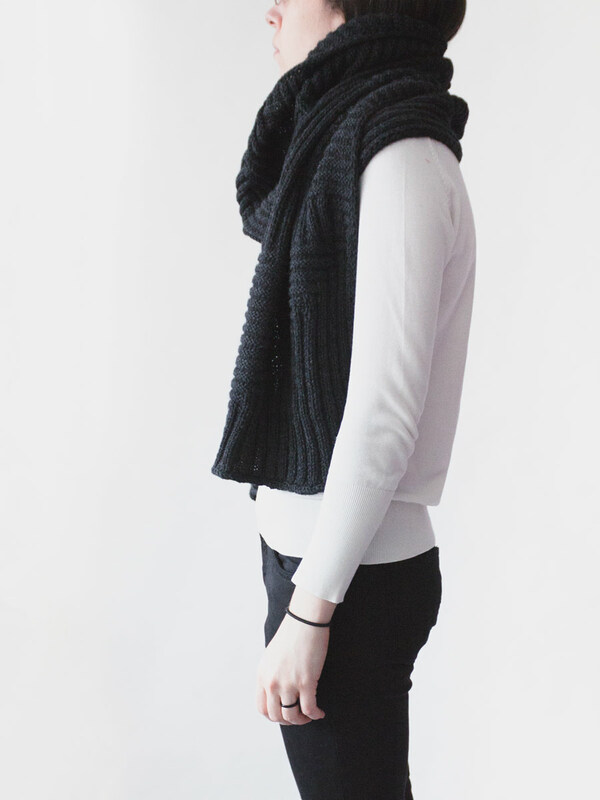 It does mean the armholes are a fair bit deeper too, and combined with the drapier fabric, the fit of this second version is more casual and relaxed. what was that about faceless ladies? This hat was once a vest, a vest that was unravelled because I ran out of yarn knitting a sweater from an unravelled dress. Knitting lends itself so well to making new things out of old things, if you can bear to rip out your own work. These particular ‘old’ things had been practically unworn, which helps (both with the ripping out itself and finding the courage to do it), although this yarn, Colourmart’s Extra Fine Merino, wears very well. 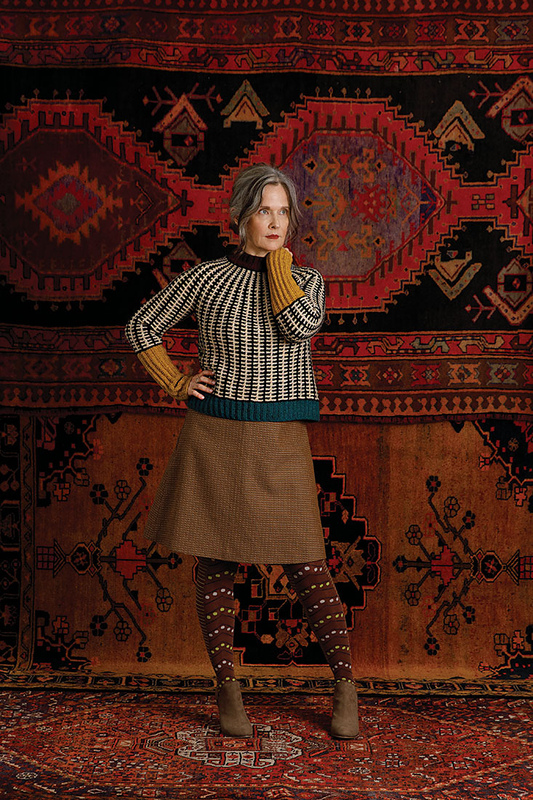 I didn’t even notice it when I took the photo, but the sweater I was wearing that day is in the same yarn – knit only a few months after the dress and the vest – and it still looks new, even though it gets worn constantly. 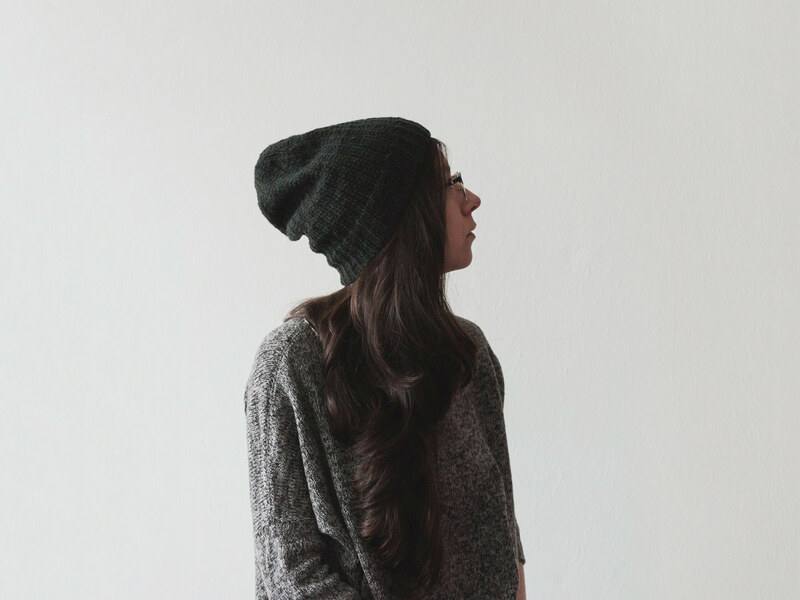 The hat is a pretty straight-forward slouchy beanie, cast on with no real plan or pattern. The stitch creates a really nice subtle ribbed look even though it’s mostly stockinette, so I’m also considering this a big swatch, to be revisited, maybe. This Christmas was the first time I knit a pair of socks for someone else. It’s incredibly convenient my recipient and I have the same shoe size, but I’m not sure I’ll be knitting socks for anyone else anyway. Hats and scarves and even gloves are easy and ‘normal’ things to give but I think hand knit socks are a bit too niche even for most of my otherwise extremely knitworthy recipients – they require that extra bit of care and commitment (to not wash your laundry too hot and know they might not fit inside all your shoes, that is) that make me worry they’re slightly too fussy to give to most people. I was planning on following a pattern because there are so, so many pretty ones that I want to try but in the end I decided to make something up myself… of course. I wasn’t getting great stitch definition with texture so I went for a simple bit of lace in a grid pattern, which is something I explored in a pullover earlier this year although I had to figure out a different stitch that would be flatter and more comfortable when worn inside a shoe. I actually tried a Fleegle heel for a change but it didn’t work well at all and I just didn’t have the time to keep experimenting, so I reverted to my trusty Fish Lips Kiss heel in the end.